Poverty Simulation – Clintonville – CAP Services Inc. 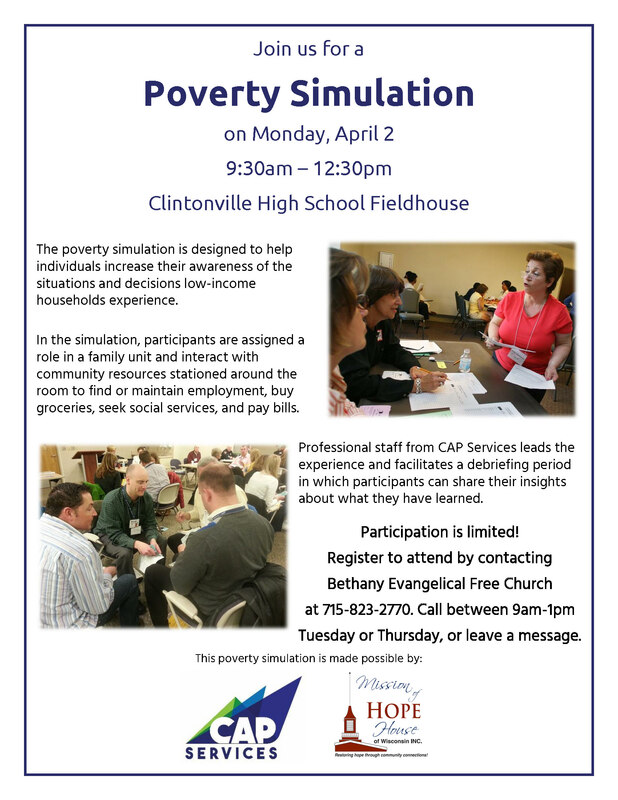 In partnership with Mission of Hope House of Wisconsin, CAP Services will conduct a poverty simulation from 9:30 to 12:30 a.m. Monday, April 2, at the Clintonville High School Fieldhouse, located at 64 Green Tree Road in Clintonville. As many as 80 simulation participants will be assigned roles in family units and receive background information on their assigned family’s income and expenses. During the simulation, participants will interact with community resources stationed around the room to find or maintain employment, buy groceries, seek social services, and pay bills. CAP’s professional staff will lead the experience and facilitate a debriefing period in which participants can share their insights about what they have learned. The simulation is free and open to the public, though participation is limited and advanced registration is required. To register contact Bethany Evangelical Free Church at 715-823-2770 from 9 a.m.- 1 p.m. Tuesday or Thursday, or leave a message. For more information about poverty simulations, including information about how to sponsor one, visit capservices.org/povsim.